get help now!GET IN TOUCH! We're proud of the quality, friendly and focused services we deliver which enables us not only to retain clients for a very long time by being their trusted partner, but for them to recommend us to their trusted partners too. Doing things right and ensuring every thing we do revolves around our core values of quality, professionalism and integrity doesn't mean we're expensive; we invest in technology, use our experience and stick to best practice to ensure we're efficient and effective. 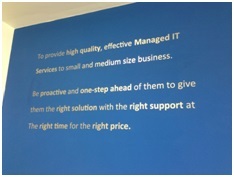 To provide high quality, effective Managed IT Services to small and medium sized businesses. Be proactive and one-step ahead of them to give them the right solution with the right support at the right time for the right price. 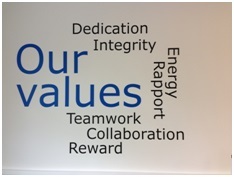 Our core values are the key to our success. Over the past decade we've worked out that these are what make us great and enable us to provide a fantastic service. We're dedicated to everything we do, which in turn ensures we always deliver a quality service. We hold Integrity at the heart of our service - our customers hold us in trusted advisor status and we won't do anything to damage that. Through our energy and rapport we know what our customers need and when; and only through true teamwork and collaboration with others - including 3rd parties and our customers can we make great things happen. All of these great things however are fuelled by reward - we pride ourselves on being a fun and friendly company, investing in our staff, investing in our customers. Good response, thanks for the callback to check all is well.